What happens when you put tap dancing Hollywood stars in the same room as one of the world’s greatest philosophers? 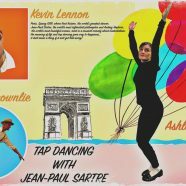 For the Traverse’s autumn season of A Play, A Pie and a Pint, Tap Dancing with Jean-Paul Sartre explores just that, with live music, and of course, tap dancing. As fun and whimsical as the title implies, James Runcie’s new play explores the meaning of life, art, and entertainment – a promising premise, but sometimes the life lessons are spelled out too blatantly, with the characters voicing their philosophical conclusions explicitly and obviously. The medium of film and the liveness of performance are cleverly explored through video projection, most memorably in a scene in which Ashley Smith as Audrey Hepburn acts out a video recording of herself dancing, complete with rewinds and fast forwards. Portraying Audrey Hepburn and Fred Astaire was always going to be a challenge, but Ashley Smith and Darren Brownlie fill the roles charmingly, and Kevin Lennon is endearing at the bumbling (and slightly creepy) professor. Despite jabs that critics prefer seriousness, this play is most triumphant in its lightness and play with what’s achievable in a lunchtime. One thing remains certain: A Play, a Pie and a Pint is the best use of a lunch break in Edinburgh.